Mark Warner leads three potential top Republican challengers for his Senate seat by double-digit margins, according to a new poll. Public Policy Polling has Warner ahead of Gov. Bob McDonnell by a 50 percent-39 percent margin, while the Democrat leads House Majority Leader Eric Cantor by 19 points (53 percent-34 percent) and Lt. Gov. Bill Bolling by 21 (54 percent-33 percent). 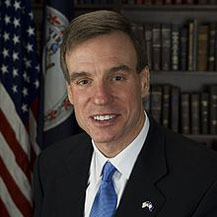 Warner’s numbers are bolstered by the favorable opinion from Virginia voters on his job performance. More than half surveyed (53 percent) approve of the job that he is doing in the Senate, with 27 percent disapproving. -There’s 77/16 support for expanded background checks on gun sales in the state. There’s a strong bipartisan consensus on the issue with Democrats (93/5), independents (72/21), and Republicans (66/23) all strongly supporting them. -80% of voters in the state think employers should not be able to discriminate against employees based on their sexual orientation, compared to only 12% who think doing so is acceptable. 94% of Democrats, 76% of independents, and 71% of Republicans think that should not be permissible. -Virginians are closely divided on Barack Obama’s job performance with 49% approving of him to 48% who disapprove. Our second look at Tim Kaine’s approval rating as a Senator finds him standing at 44/38. -Virginia and Virginia Tech have one of the more closely divided college sports rivalries in the country with 30% of voters saying they prefer the Hokies to 28% who go for the Cavaliers. Speaking to the in migration to the state, 42% of voters don’t care one way or another. There’s a partisan divide on college sports loyalties with Democrats preferring the ‘Hoos by a 35/28 margin, while Republicans go for the Hokies 34/29.